I recieved a form rejection letter again, this time from one of my my top choices. So far I’ve gotten no feedback on anything, so I’m trying to remain distanced as I start thinking of ways to better the submission packet. Guessing what is turning people off is a difficult thing to do. If anyone has any experience in this department, I’d LOVE a few pointers. I’ll combine this problem with my morning writing sessions and write it all over from every perspective (which is a lot of perspectives). What I am currently thinking I did wrong: I gave too much thought to the rules and not enough thought to voice. Well, seven rejections on, I don’t think I’ll be as hesitant to break a few rules. Time to make this submission packet stand out. Well, it’s been quite a few days, guys. Sorry about that. I was trying to update at least once every two or three days, but life happens. Sometimes, life happens really hard and fast, leaving you blindsided in an emotionally crippled heap on the ground. But time heals. Well, time and superhero movies. And alcoholic cider that tastes like apple pie. Anyway, Four weeks and a day have passed since my last submission went out and I decided to look over the submission protocol for the remaining agents. Most of them still have plenty of time before they estimate I will hear from them, but one agent’s website says if you don’t hear from her in two weeks, she’s likely not interested. Well, it’s been four weeks and I’ve heard nothing, so I guess she’s out of the running. I guess that only leaves four. This list is slimming rather slowly. Hopefully I’ll hear back from the others soon, but even right now it looks as if I’ll be making changes to the submission packet even if I get a request for a manuscript from one of the remainders. This is one hell of a way to learn! Tamora Pierce was rejected four times before someone recommended editing her manuscript for The Song of The Lioness into a young adult series. I have been unable to find how many times it was rejected after that. If you’d be interested in learning more, there is a website dedicated to stories of bestsellers and their initial rejections. So, another rejection to add to my spike, but at least I have a lovely fritatta. So, my good friend Olivia once got the coolest writing present ever. Her grandfather (I believe) made her something called a rejection spike. It was the first one I’ve ever seen and if you do a google image search, it’s the only one that comes up. Well, mine might come up now, you never know. Anyways, when I started my submission process, she recommended making one so every time I got a rejection, I could print them off and drive them through on the spike. I thought about what I would want to make mine out of. Olivia’s is made from a plank of wood and a railroad spike. Wexford, being the great metropolis it is, doesn’t have railroad spikes just laying around, besides, that one’s Olivia’s. That night I was talking to the man creature and he recommended I try this catch-all shop in town. I was headed into the library and would pass by it anyway, so I popped in. 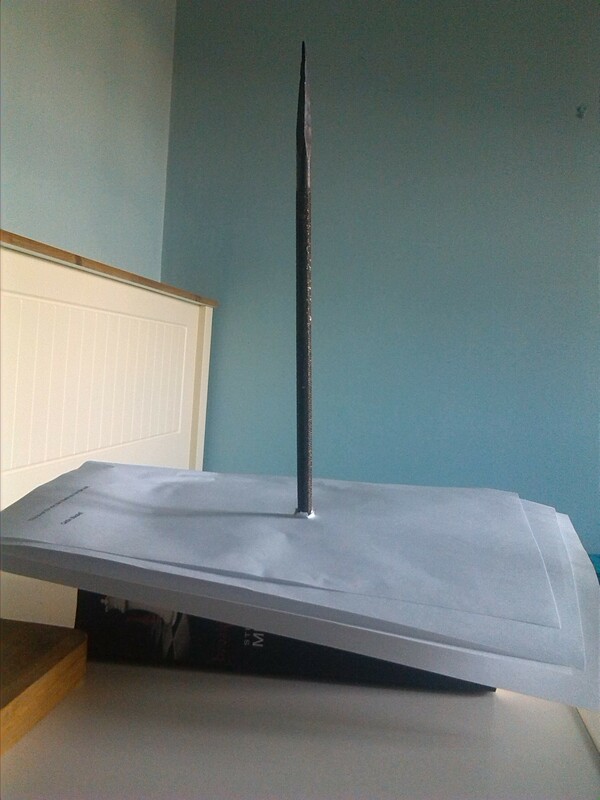 I had to dig to the bottom of a crate of old, dirty, rusted garden tools (thankfully, I have an updated tetanus shot), but I found this long, thin file with the perfect point at the top. Even better? The woman sold it to me for a whole euro. Next, I needed a base. It needed to be quite thick since the file is solid metal and heavy. Enter Irish charity shops. 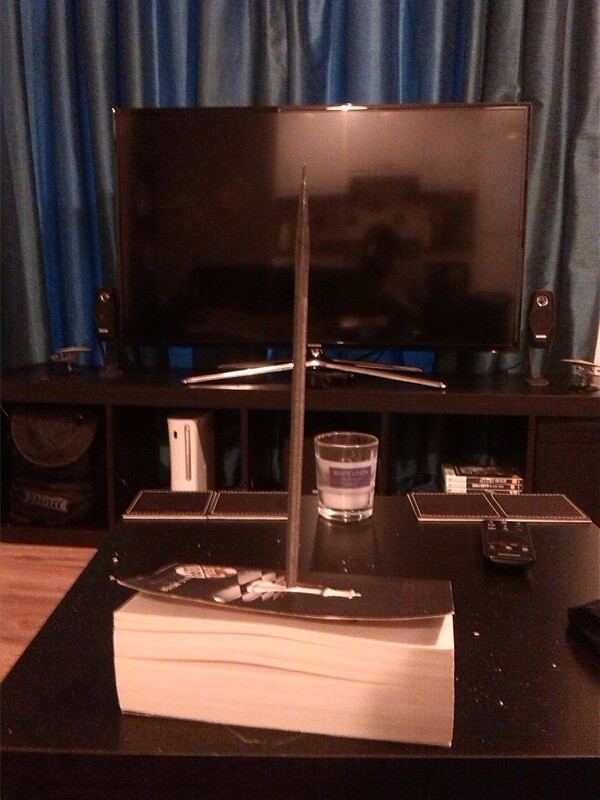 They always have books there and books can be quite thick. I thought, why not? Then perfection happened. 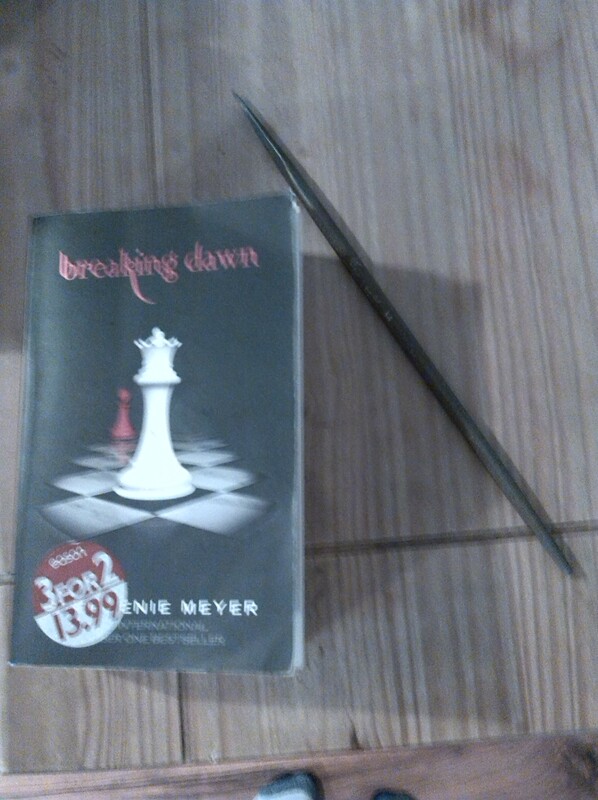 They had a copy of Breaking Dawn by Stephanie Meyer. Now, anyone who knows me knows I’m not a fan. I’m not one of the rabid anti-fans, but I never thought I would buy one of her books. Well, I did. I just also happened to drive a metal spike through it. I figure it can serve as a reminder that if Twilight can get published, so can I. 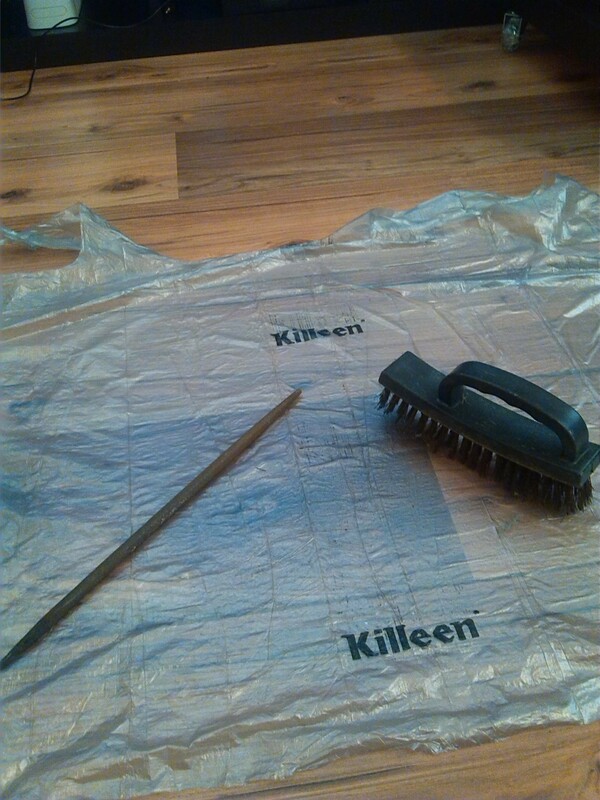 First, I had to clean the file with a wire brush. It was pretty dirty, so it took a while. 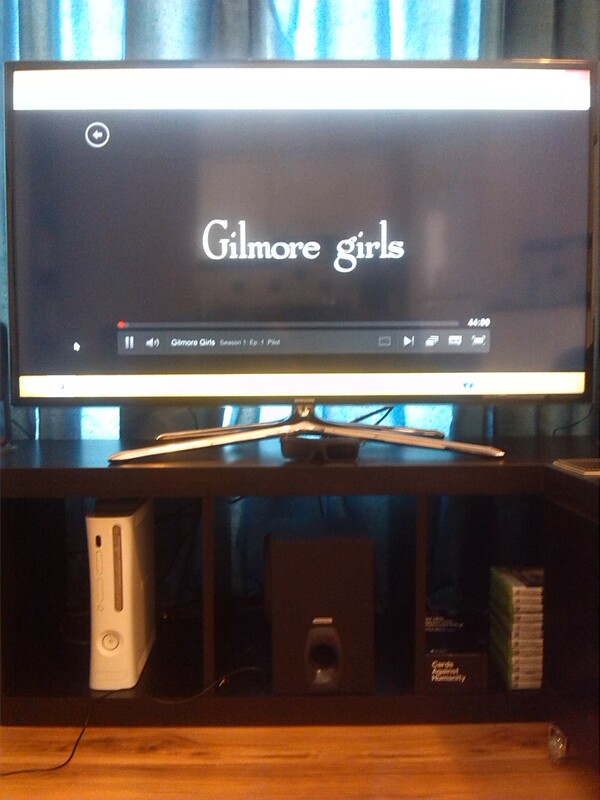 And as it happens, Netflix had just recently added Gilmore Girls. I never really watched it when I was younger, so I figured “Why not?”. I nearly lost it when baby Sam Winchester popped up, calling himself Dean. It took a while and I lost a few layers of skin on my hands since, you know, it IS a file and I had no drill. The finished product on my desk with four rejections. And let me tell you, driving the rejections through is SO satisfying!